Adjustable and dimmable led grow light, red/blue light choose freely according to yourplant needs. User-friendly led grow light, with 360° strong flexible gooseneck /clamping range up to 3inches can be bent to any angle and direction. Goose neck length (from head to clip): 15"
【Newest Design】2 in 1 Features: two heads Light and double 360 degree rotation gooseneck, it will cover a larger space. One grow lamp can be used for two small indoor plants; you can turn on or turn off the dual head LED grow lights separately due to the individual switch; it also has a line buckle, which can fix line well, providing a better and safer use. 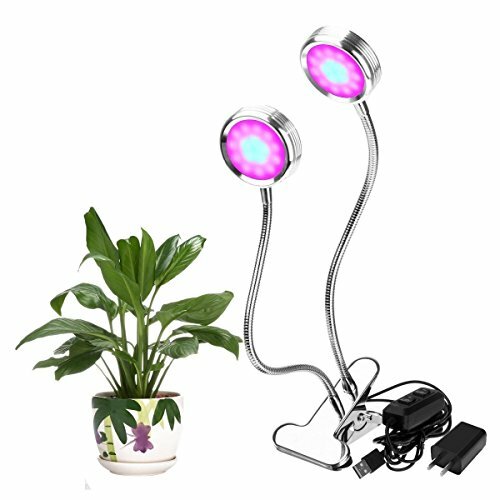 【Multi-Functions】Dual head LED grow light has 32pcs LED lights,(22pcs Red,10pcs Blue). Red lights (650-660nm),It's efficient and beneficial for photosynthesis, best for indoor plants flowering and seed production. Blue lights (450-460nm),it's best for promoting the stem and leaf. 【Flexible Arms】You can position the light in any direction,and strong enough.The length of the arm is about 20 inches,and the cord length is about 57 inches. 【Wider Use】Fit for balconies, greenhouses, darkroom, office,etc. Widely apply to the culture solution, gardening, family balcony seeding / seedling / breeding, Flower Show, potted plants.the plant needs extra light when raining, snowing, dark indoor, etc. 【Warranty】If you have any questions about the LED grow lights, we will offer you the professional technical support within 24 hours. If you have any questions about this product by LENDOO, contact us by completing and submitting the form below. If you are looking for a specif part number, please include it with your message.